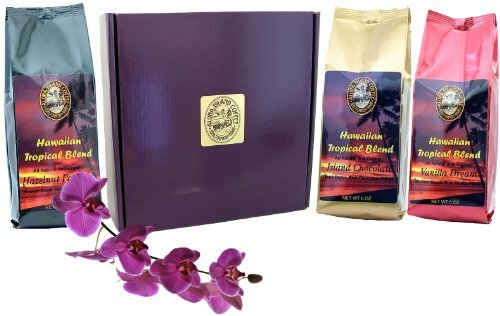 Coffee lovers who prefer flavored coffee will love this Flavored Coffee Club (Ground coffee for the convenience of your gift recipient) Six months of our Kona Smooth Hawaiian Tropical Blend Coffee, full of flavor, delivered right to you or your gift recipient's door. 8 oz of a different flavor each month for six months. Six delicious flavors, including French Vanilla, Hazelnut, Chocolate Fudge, Southern Pecan, Cinnamon Hazelnut, and Chocolate Almond. Enjoy the rich and delicious aroma and flavor of our wonderful flavored coffee for six full months! Shipping is via USPS Priority Mail and is free of charge. Six months of our Kona Smooth Hawaiian Tropical Blend Coffee, full of flavor, delivered right to you or your gift recipient's door. 8 oz of a different flavor each month for six months. NOTE: This is GROUND (drip grind) coffee. Our coffee flavorings are Organic, Sugar-free, Soy-free, and Gluten-free. Six delicious flavors, including French Vanilla, Hazelnut, Chocolate Fudge, Southern Pecan, Cinnamon Hazelnut, and Chocolate Almond. Shipping is via USPS Priority Mail and is free of charge.